With the recent craze with the price of Bitcoin as well as many altcoins rising up there is a huge wave of new GPU mining rigs as well as new crypto miners getting into the game. We already know that there are shortages of the very popular AsRock H81 Pro BTC motherboard for 6x GPUs for a couple of months now, but even more recent and more expensive motherboards with 150 and 250 series of Intel chipsets that support up to six video cards are also disappearing from the market. Next are probably the high-end gaming motherboards with 6x PCI-E slots that will work with six video cards if the trend continues. The Pro BTC motherboard from AsRock is hugely popular as it was designed for GPU mining and works out of the box, for other motherboards you need to usually do some tweaking of the settings and not all models have the right settings available in the BIOS or may have some specific issues. Another serious advantage of the Pro BTC series is the price, no extras not needed for mining means lower price point, though at the moment the demand and speculation has risen the price of these boards as well (if you manage to find one). 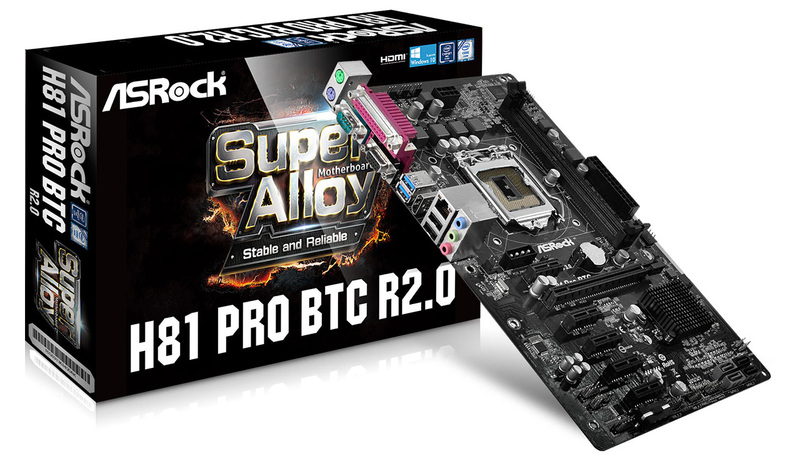 It is quite interesting why when there are shortages of H81 Pro BTC motherboards AsRock still hasn’t found a solution such as releasing a version of their mining motherboard with more up to date Intel chipset such as B150 or B250 for example. It seems that the competition is also trying to take advantage of the situation and grab some of the market that was up until recently dominated by AsRock. Such an example is the recent release of the Biostar TB250-BTC motherboard. The problem with Biostar however is that the brand has a much limited distribution when compared to AsRock and thus is harder to find, not to mention impossible for many markets around the world, so this is actually not a solution to the problem. AMD’s new Ryzen motherboards are showing some potential for possible use for GPU mining rigs, however there is one serious issues with that platform using the new AM4 CPU socket and that is the lack of cheap low-end processors. That is precisely why Intel is the preferred platform for GPU mining – cheap Celeron processors that do the job well and not so expensive motherboards, though with the lack of AsRock H81 Pro BTC boards the expenses for a motherboard have risen as well. Maybe when AMD introduces lower-end Ryzen APUs things might get more interesting for the miners as well, especially if things with the availability of cheaper Intel motherboards that work for six video cards do not improve meanwhile. Even the cheapest AMD Ryzen 5 CPU at the moment, namely the 4-core/8-threads AMD Ryzen 5 1400 is too expensive for miners when compared with Intel Celeron G1820/G1840 for Socket 1150 or Intel Celeron G3920 for 1151 for example. With the switch from Radeon RX 400 series of GPUs to the new (rebranded) RX 500 series AMD has also gotten into a bit of trouble with the increased demand from miners. The older RX 400 series of video cards are quickly disappearing and there may not be enough RX 500 series on some markets to cover the demand until the company manages to deliver steady supply everywhere. As a result we have seen some markets that end up with higher priced RX 500 series of GPUs when compared to their RX 400 counterparts when there is actually not much of a difference. Smaller markets are also experiencing serious shortage of video cards due to the increase in demand. Nvidia on the other hand has plenty of GPUs available, however miners are not that much into mining with Nvidia-based video cards due to the higher price, even though they generally are more powerful and use less power in most algorithms. The higher price of Nvidia GPUs combined with the not so great Ethereum (Ethash) mining performance however is driving the demand for AMD GPUs and the recent spike in ETH price has made things even worse in terms of Radeon GPUs availability. Guess we’ll have to wait and see how things will go, but if the price of crypto currencies continues to rise like it has been recently things may get even worse.